This quarterly financial report for the period ending December 31, 2018 has been prepared by management as required by section 65.1 of the Financial Administration Act, in the form and manner prescribed by Treasury Board. The report should be read in conjunction with the Main Estimates as well as Equality and Growth for a Strong Middle Class (Budget 2018). This quarterly financial report has not been subject to an external audit or review. However, it has been reviewed by the Departmental Audit Committee prior to approval by senior officials. Information on the mandate, roles, responsibilities and programs of Public Safety Canada can be found in the 2018-19 Departmental Plan and the 2018-19 Main Estimates. This quarterly report has been prepared using an expenditure basis of accounting. The accompanying Statement of Authorities table includes the Department's spending authorities granted by Parliament, or received from Treasury Board Central Votes, and those used by the Department consistent with the Main Estimates, Supplementary Estimates (A), and the Budget 2018 for the 2018-19 fiscal year. This quarterly report has been prepared using a special purpose financial reporting framework designed to meet the information needs concerning the use of spending authorities. Public Safety Canada uses the full accrual method of accounting to prepare and present its annual departmental financial statements that are part of the departmental performance reporting process. However, the spending authorities voted by Parliament remain on an expenditure basis, as do the expenditures presented in this report. Ministers' Salary and Car Allowance. Starting from the left hand side, the “first” column in the graph indicates that the Department authorities are at $1,160.0 million for fiscal year 2018-19. The year-to-date expenditures of $343.8 million reported at the end of the third quarter of the 2018-19 fiscal year are shown under the “second” column. The expenditures of $147.9 for the period ended December 31, 2018 (i.e. third quarter) are presented under the “third” column. 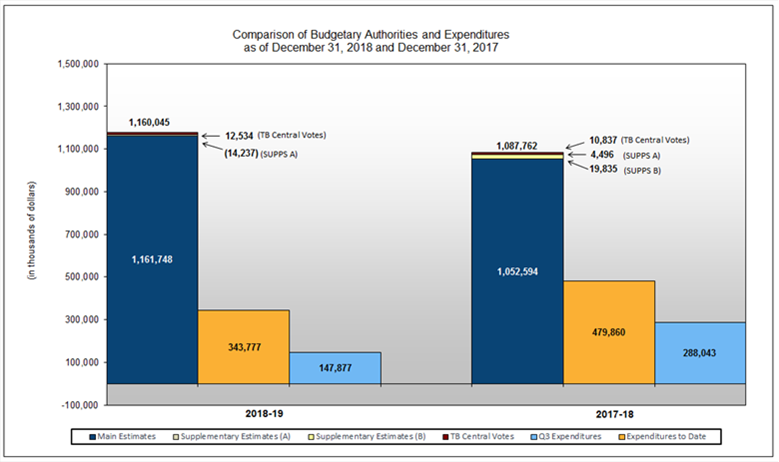 The “fourth” column in the graph depicts the 2017-18 authorities which were at $1,087.8 million at the end of December 2017. The 2017-18 year-to-date expenditures of $479.9 million are shown under the “fifth” column. The Departments’ actual expenditures incurred in the third quarter of 2017-18 were $288.0 million and are shown under the “sixth” column of the graph. Notes: (1) The 2018-19 TB Central Votes include $3,980K for Budget 2018 authorities, $6,173K for the Operating Budget Carry Forward, $1,468K for the compensation adjustments and $913K for the eligible paylist expenditures. (2) Supplementary Estimates (A) is a negative amount due to transfers out to the Royal Canadian Mounted Police for the First Nations Policing Program. For the period ending December 31, 2018, the authorities provided to the Department include Main Estimates, Budget 2018 authorities, Supplementary Estimates (A), and TB Central Vote transfers. The 2017-18 authorities for the same period included Main Estimates, Supplementary Estimates (A) and (B), and TB Central Vote transfers. The Statement of Authorities table presents a net increase of $72.3 million (6.6 percent) compared to those of the same period of the previous year (from $1,087.8 million to $1,160.0 million). An increase of $1.0 million for negotiated salary adjustment. A net decrease of $1.0 million for other initiatives of lesser value. A net increase of $1.2 million for other initiatives of lesser value. A decrease of $1.0 million regarding temporary funding in 2017-18 in support of the Canadian Red Cross' Spring 2017 flood relief efforts across Canada. Budgetary Statutory authorities have increased by $1.3 million (8.4 percent) in 2018-19 mostly as a result of the Employee Benefit Plan (EBP) costs associated with the change in the Department budgetary requirements for salary and EBP. A decrease of $4.7 million related to the timing of payouts for the Safer Communities Initiative. A net increase of $4.4 million for other expenditures variances of lesser value. Compared to the previous year, expenditures used during the quarter ended December 31, 2018 have decreased by $140.2 million (48.7 percent) (from $288.0 million to $147.9 million) as reflected in the Departmental Budgetary Expenditures by Standard Object table. Personnel expenditures have increased by $1.6 million. Other operating expenditures have increased by $4.0 million. A decrease of $7.8 million related to payments in support of the safer communities initiatives. A net increase of $1.1 million for other initiatives of lesser value. The Department's mandate spans from public safety and security, intelligence and national security functions, social interventions for youth-at-risk, to readiness for all manner of emergencies. The Department is called, on behalf of the Government of Canada, to rapidly respond to emerging threats and ensure the safety and security of Canadians. The Department's ability to deliver its programs and services is subject to several risk sources, such as the rapidly changing asymmetrical threat environment, its ability to respond to natural or man-made disasters, government priorities, and government-wide or central agency initiatives. To deliver this mandate effectively, the collaboration of many departments and agencies, provincial and territorial governments, international partners, private sector and first responders is required. The Disaster Financial Assistance Arrangements (DFAA) contribution program presents a greater level of risk and uncertainty than other Public Safety Canada (PS) grants and contributions programs given that it represents a significant portion of the PS budget and that it is subject to unforeseen events. The DFAA contribution program was established in 1970 to provide a consistent and equitable mechanism for federal sharing of provincial and territorial costs for natural disaster response and recovery where such costs would place an undue burden on a provincial or territorial economy. There are currently 71 natural disasters for which Orders-in-Council have been approved, authorizing the provision of federal financial assistance under the DFAA, and for which final payments have not yet been made. Public Safety's total outstanding share of liability under the DFAA in regards to these 71 events is $2.4 billion as of December 31, 2018, the majority of which is expected to be paid out over the next five years. Saskatchewan 2011 Spring Flood ($109.7 million). An increase of $28.3 million for newly approved Orders in Council, which authorize funding for recently occurred natural disasters for which Provinces and Territories require the federal sharing of costs. A decrease of $78.4 million for payments issued in the third quarter under the existing obligation. In April 2016, PS moved to the new Phoenix federal public service pay system. In transitioning to the new pay system, large backlogs and delays at the centralized Pay Centre have led to a significant increase in pay-related issues reported by employees. To support employees at highest risk, the Department continues to work on a range of issues that falls within the department's scope of control to support employees who are experiencing difficulties with their pay, including: providing emergency salary advances, analyzing and resolving integration issues between the department's Human Resource Management System and the Phoenix pay system. Issues affecting PS employees and the measures the Department is able to take to help mitigate them have been discussed with the unions at local and national level management consultation committees. At these meetings, union representatives have been engaged to ensure that employees' perspectives are shared with Management. The Department is closely monitoring pay transactions to identify and address over and under payments in a timely manner and continues to apply ongoing mitigating controls which were implemented in 2016. Budget 2018 announced funding for the Communications Security Establishment (CSE) to create the new Canadian Centre for Cyber Security. On the recommendation of the Prime Minister and in compliance with the Order in Council signed and published on August 23, 2018, Public Safety Canada transferred the control and supervision of the Canadian Cyber Incident Response Centre (CCIRC) to the CSE on October 1, 2018. The financial impacts of the transfer will be reflected in future quarterly financial reports. (1) Includes only authorities available for use and granted by Parliament at quarter end. (1) Includes only planned expenditures against authorities for use and granted by Parliament at quarter end.